A Nigerian teacher, Zion Oshiobugie is set to marry one of his former student. 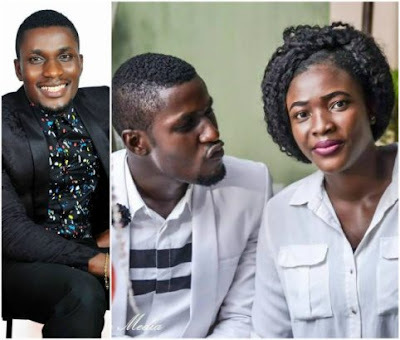 He took to Facebook to disclose that he will be marrying his ex-student, Elohor Omohiro, who once came to his learning center to buy JAMB form in 2012. I have been teaching since 2008. The job is challenging, mind bugging and mentally demanding, as such you may not have time for yourself. 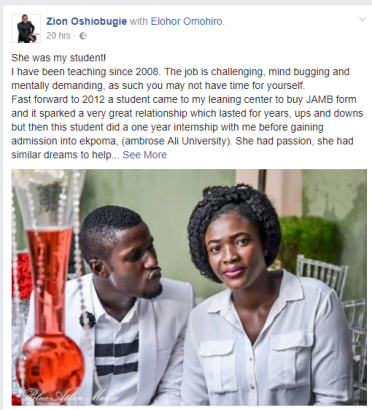 Fast forward to 2012 a student came to my leaning center to buy JAMB form and it sparked a very great relationship which lasted for years, ups and downs but then this student did a one year internship with me before gaining admission into ekpoma, (ambrose Ali University). She had passion, she had similar dreams to help students most of all she made sure we hit our goals every single time she came back from school. She was so dedicate to the business that we grew from one learning center to three learning centers in less than 3 years. We all have various reasons why we get married but for me I am getting married to my student who has been there for me through thick and thin, hard times, sad times, depressing times to say the least. We count down to 22nd July 2017. My other half is Elohor Omohiro, once my student but now my wife. God don put better thing inside my kpangolo. Very soon I go sing “somebody is on the way o bigi Bigi bouncing baby”.